Battn moved at 12.30am marched via LA BOURSE and SAILLY, arriving at a reserve line of trenches SE of NOYELLES at point L12 o 6.6 at about 3am. Bombardment became intense. At about 6am the attack was launched. Battn ordered to advance through VERMELLES up communication trench (CHAPEL ALLEY) to occupy front line at point G11 o 9.8. Capt King wounded. 2/Lt FH Friend assumed command of 'A' Coy. Following the advance of the 20th Brigade the Battalion occupies the front and support German lines. Lt Col BH Leatham DSO then gave orders for the Battn to advance in open order in direction of CITE ST ELIE keeping to the north of HULLUCH ROAD, our right flank connecting with the 2nd Bedfordshires left. The Battn advanced in the following order, 'B' Coy on the left Capt WM Geddes in command, 'A' Coy on right 2/Lt FH Friend in command, two platoons of each company leading, two platoons immediately behind, 'C' Coy in support, 'D' Coy in reserve, Major RMP Gillson in command of'C' Coy, Capt EC Mudge in command of 'D' Coy, the whole were led by Major CG Forsyth, and experiencing extremely heavy rifle and machine gun fire from the front came to a line held very weakly by a mixture of 8th Devon & 2nd Borders. The trench contained 4 German field guns and ammunition. Our losses were heavy and included the following Officers casualties Capt GMU Wilson, 2/Lts CFB Hodgins JH Clarke WHG Durrant killed. Major RMP Gillson, 2nd Lt FH Friend wounded the latter seriously. In the early hours of the morning the Comdg Offr Lt Col BH Leathen DSO received a bullet wound in the chest and died almost immediately. During the the day the Battn remained in the aforesaid position and there is nothing to report other than the order to be ready to render a covering fire in support of an attack which was to have been made on our left, but which was afterwards cancelled. Major CG Forsyth assumed command. In the evening the Battn were ordered to take up a new position in reserve trenches running at right angles to and on the North of HULLOCH ROAD immediately behind the German trenches. After being relieved by the 1/4th Cameron Highlanders the night was spent in improving our new position. In this position the Battn was in support to the 1/4th Cameron Highrs. Dr MS Wilson of Chippenham received a telegram on Wednesday (29 Sept) morning stating that his youngest son Capt Geoffrey Wilson of the Wilts was killed in action in France. The deceased was a popular man in Chippenham where his loss is deeply regretted. Capt Wilson was educated at Marlborough. He was promoted to the rank of Captain on the field for his gallantry in leading on the men when other officers had been killed. 26 September 1915. Killed in action in France. Capt Geoffrey Mervyn Underhill Wilson, Wilts Regt. Youngest son of Mervyn S Wilson of Chippenham aged 21. The stained glass window, which has been placed in the Parish church by Dr and Mrs Wilson in memory of their 3 soldier sons, who have been killed in the war, was unveiled and formally dedicated on Sunday evening. The holding of the dedication service coincided with the date (29th September) on which one son was born, another baptised and another killed. To the Glory of God and memory of the 3 sons of Mervyn Seppings and Helena Jane Wilson. Herbert Raymond Wilson, Capt, 114th Maharattas. Born September 29th 1888. Killed in action January 9th 1917 in Mesopotamia. Evelyn Seppings Wilson, Capt, East Yorks Regt. Born March 5th 1893. Killed in action September 29th 1915 at Hullock, France. Geoffrey Mervyn Underhill Wilson, Capt, Wiltshire Regiment. Born August 5th 1894. Killed in action September 25th 1915 at Loos, France. The Wilson family came to Chippenham in 1887. 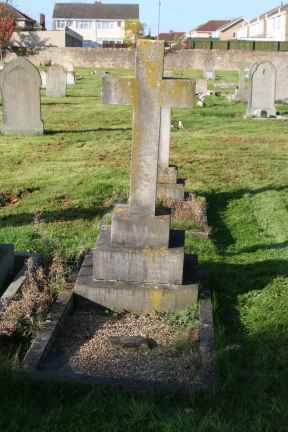 Mr Wilson was a county councillor in 1904 - 1910 and church warden of St Andrew's church. Mrs Wilson became the commandant of the Chippenham Red Cross hospital and was appointed OBE for her war service. If you have any more details about this person, please contact me and I will update the page.